A vending machine mysteriously conceals the main entrance to the Hyde Park Art Center’s School and Studio. The repurposed vending machine was fitted into an existing doorway in 2010. Inquisitive visitors to the School and Studios will be surprised when they pass through an innocuous utility door only to emerge from inside the non-functional vending machine. Central to Patrick Killoran‘s strategy is the artwork that pretends to be something it is not, often times transitioning the viewer from unwitting observer to analyst. 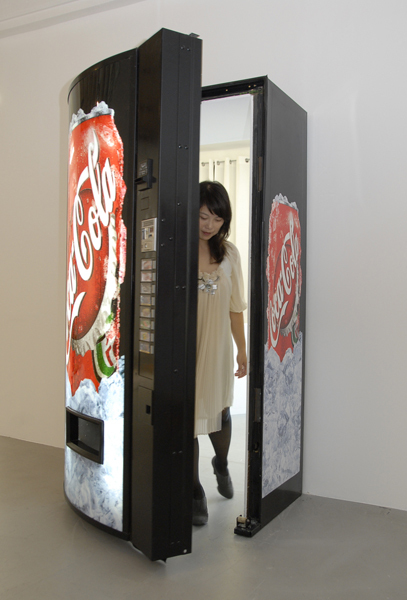 The title of the work, Immergence or “to disappear into” points to how vending machines have been assimilated into our everyday reality. Located at the physical threshold between art gallery and artists’ studios, interacting withImmergence becomes a non-negotiable experience for visitors wanting to travel from one space to the other. The position of the machine satirizes the supposed freedom to disregard corporate imagery, and underscores our constant bombardment with opportunities for consumption. Immergence provides the participant with another such opportunity. Immergence was first presented at Las Cienegas Projects in Los Angeles in 2009 before receiving it’s temporary home at Hyde Park Art Center. Patrick Killoran’s work focuses on turning objects of public consumption into objects of public speculation. From modified taxi cabs, to t-shirts, to outhouses, Killoran’s work disturbs the normal functioning of each item, integrating art into everyday life. Killoran has been actively exhibition and producing work since the 1990s. His work has been exhibited in international shows including: the 1998 Biennale of Sydney in Australia, Wanas 2000 in Sweden, Contemporary Arts Museum Houston, the Witte de With in Rotterdam, Netherlands, and ev+a (2005) in Limerick, Ireland. His most recent projects have been presented at the Center for Contemporary Art in Prague, IKON in Birmingham, SculptureCenter and MoMA P.S.1 in New York City and the Mori Museum in Tokyo. Killoran was the Pick Laudati Fund for Arts Computing Artist in Residence in the Department of Art Theory and Practice at Northwestern University during the spring of 2010. He is the 2017 External Examiner at the Iceland of the Arts Academy, a Collaborator at SOMA Summer in Mexico City, and a Critic at Yale University School of Art, Sculpture. He currently spends his time working between New York and Los Angeles.